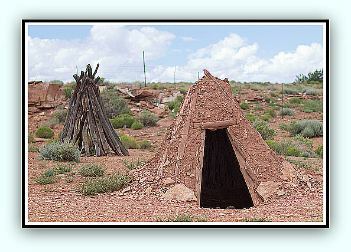 The sweat lodge is also known as medicine house, sweat house, medicine lodge and purification ceremony. It is a ceremonial and spiritual sauna used by some Native Americans and North American aborigines. The native people used three forms of medicine house. Hot rock was the type favored amongst the tribes. It was small and rather domed shape in appearance. Willows were gathered for the framework then it was covered with mud and blankets or animal skin. In order to support the granite rocks which are heated outside a depression is dug near to the entrance. The rocks are carried in and a buffalo horn is filled with water and the water sprinkled over the rocks to create the steam. The door flap is closed so that the steam doesn't escape. South West Indians and Alaskan Eskimos used this technique. The structure is larger, the fire is kept burning all day. In the evening, dancing, gossip and talk and occurred. The fire was increased even more to supply heat. The lodge was reserved for men so women would rarely enter. The Mayan people were the first ones to use it. Although examples of this method no longer exists it can be seen in the hieroglyphics of the Mayan. The temazcal was believed to be smaller than their normal buildings. Even though rituals and traditions would vary in different tribes and regions there was a common theme, drumming, prayers performed by the shaman and contributions to the spiritual world. As time went on, they used and discovered methods that were rather easier. For example a lighter would be used to start up the fire. A truck is used to heave rocks and wood. At any moment in time the ceremonies can change if it is required. There are practices and some key elements common to the sweat lodges. Find out what those are in part 2 and also see how a lodge is built.